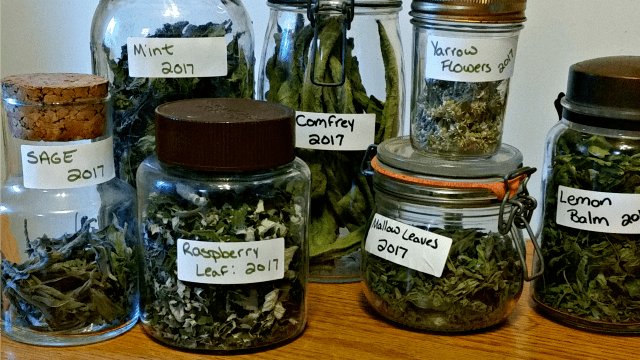 Herbs and their many uses are a huge part of my homespun seasonal lifestyle. I use them for teas, food, body products, and herbal remedies. Thankfully, it's easy to dry herbs and keep them on hand for the long winter months when nothing fresh is growing in the herb garden. Before we can dry herbs, obviously harvesting must happen. How harvesting happens naturally depends on the herb. Leafy Herbs: Cut the stems about one inch above the soil. This is for any herb from which we want the leaves, think mint, lemon balm, comfrey, oregano, etc. Harvest before flowering for best flavor. Floral Herbs: Most flowers should be gathered when the blooms are fully open and before they wilt or turn brown. Cut these blooms about an inch below the flower head. Think roses, calendula, dandelion, feverfew, etc. There are some rare exceptions here, lavender, for example, can be and is often harvested before all the blooms open for drying. Whether the herbs are foraged or homegrown, a wash is a good idea. Washing helps remove insects, dirt, and other possible contaminants (in case the neighbor's cat or dog or a deer stopped by, for example). Soak those herbs in some water, give them a spin a salad spinner and spread out on a towel to remove surface water. Gather those leafy herb stems in bunches. About 10-15 stems per bunch. Gather them so the cut ends are all together. Tie some twine or leftover bits of yarn around the cut end of the stems. Tie this very tightly. Tight is important – as the stems dry, they shrivel and can slip out of their noose if it isn't very tight. Leave a long tail of twine or yarn and use that tail to hang it. 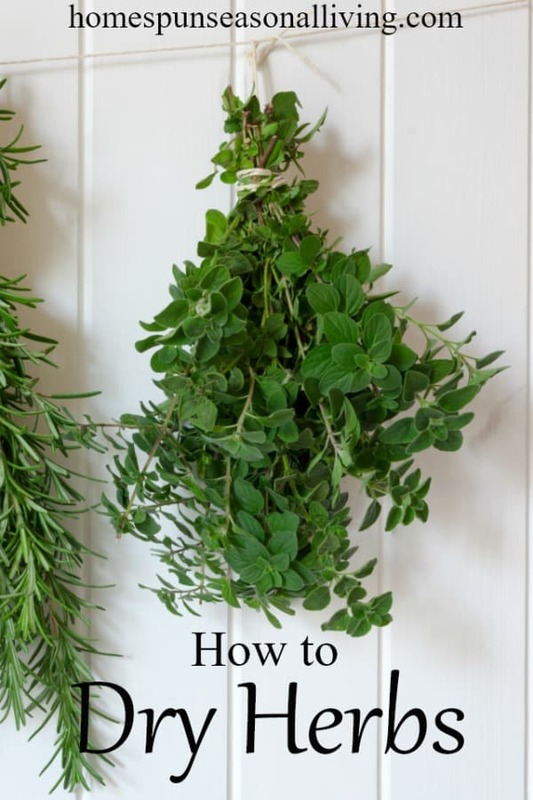 Using the tail of yarn or twine, hang the herbs to dry. Hang them from hooks, tie the tail around clothes hangers and hang in the closet, tie them around beams or use a clothing rack. Anything works. Simply hang them in a location out of direct sunlight. It doesn't have to be completely dark, just not in direct sunlight. I often hang mine from a coat rack in the guest room and pull the curtains. An optional labeling step: If worried about identification once the herbs are dry, label them before hanging. Simply tie a piece of scrap with the name of the herb to the string. This way when completely dry there's no confusion between oregano and marjoram or sage and comfrey. Lay those flower blooms out on trays or screens to dry. Hanging is an option here too, but from experience I've found that laying them out on racks to dry is much better. Use dehydrator trays or cooling racks, even a clean window screen (or make your own herb drying screen) for this purpose. To use dehydrator trays, spread the blooms out on the trays and place the trays back into the dehydrator. Leave the door off the dehydrator and do not turn it on. 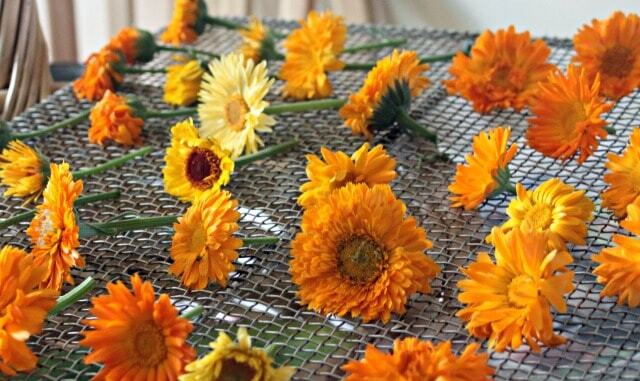 Simply use the dehydrator as a storage bin for the flowers to dry on their own. If using window screens or cooling racks, spread the blooms out and put the racks or screens where they will get nice air flow around the blooms and leave out of direct sunlight. One exception to this general process is lavender. The lavender buds have a tendency to fall out as they dry. This is true whether hanging or putting on trays. To prevent the loss of buds, tie lavender in bunches inside a bag (either cloth or paper), the bag will catch any fallen buds to be put away later. Once the herbs are hung or spread out, there's nothing to do for a bit. Simply let the herbs dry in the time it takes. The goal is for the herbs to be crispy and completely dry. The time it takes for this to happen will vary. Most will be ready within 7 days sometimes longer, sometimes shorter. Heat and humidity play a role here, just let them dry as nature intended. Letting them hang longer is never going to be a problem. Too short of a time can result in moldy herbs so make sure of crispy doneness. Once the herbs are completely dry, it is time to get them ready for long term storage. Cut the leafy herbs from their bundles. Over a wide bowl, strip the leaves from the stems. Simply start at the cut end and run fingers along the length, letting the dried leaves fall into the bowl. Put these dried leaves into labeled jars and store in your pantry out of direct sunlight. Floral herbs can either be stored as whole flower heads or remove the dried petals from the flower. Having a pantry full of homegrown or local herbs is a thing of practical beauty. These dried herbs are the foundation of flavorful and sometimes healing teas. They season meals when fresh isn't available and can be the basis for healing and body care. The best part about dry herbs is that it's easy and will keep with very little hands-on time. So get out there when the getting is good and build your own pantry of dry herbs. Kathie, I need help! : ) I did what you recommended on my mint and lemon balm plants, but a year or so later when I tried to make some tea with them, it tasted just awful. More like a green plant and not the nice mint or lemon flavor. Did I wait too long to use them? Also, regarding the timing of the harvesting — how tall (or mature) should the stems be? And do you harvest before the flowering? My mint is currently flowering and bringing in a lot of bees to the garden! Thank you for your help. They definitely lose flavor after about a year. I would say try to use them up before a year passes. 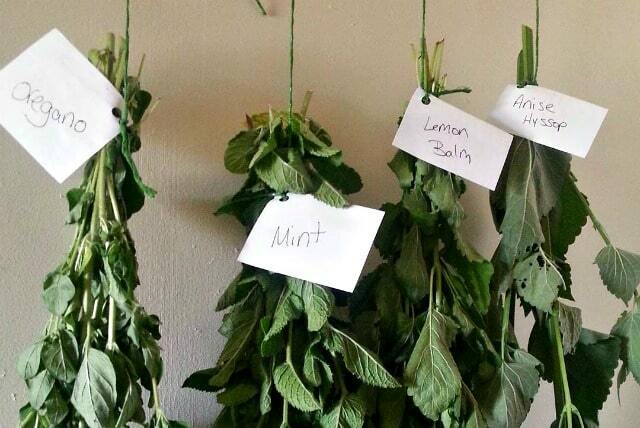 Harvest mint & lemon balm before flowering – once they flower they lose most of their flavor in my experience. I like to dry herbs tied and hung in the cool basement. I save seed from many plants in a similar way but with a paper bag over them to catch the seeds as the plant dries out. I live in a trailer and have no basement or much closet space to dry herbs. I washed the lemon balm, put it on a cookie sheet tearing the leaves up and throwing away the tough stems, then put it in the oven at it’s lowest setting. It didn’t take long to dry. I put it in a jar and keep it in the freezer. I would like to know if this seems like an acceptable way to keep it? If something is dehydrated, storing it in the freezer isn’t necessarily the best option. Freezers can often have a lot of humidity which can shorten the life of some dried goods. You can always freeze herbs by chopping them up small and putting about a teaspoon into ice cube trays. Fill with water and then freeze. Pop out of the trays and store those cubes in bags. Then just melt to get the herbal flavor into your foods. nice article! it has been so humid in my kansas home, i have been using the dehydrator for basil leaves and citrus slices. trying to dry lemon and lime peels to save rind/peel and for popurri, they molded on the counter. so my little dehydrator has been really handy for this. I can’t find anything to say for sure but I wouldn’t use it if it’s got powdery mildew on it, personally. I am so glad to know this was useful to you!